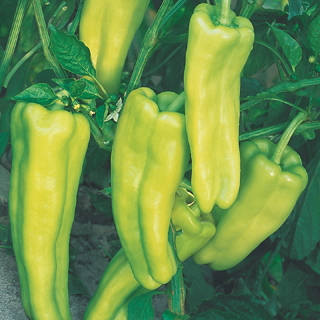 Enjoy bountiful harvests of these beautiful 5.5" - 6.5" long lime green peppers early in the season. Vigorous, erect plant produces large, straight fruit of outstanding size, yield and uniformity. Continuous setting plant provides an extended harvest period. Plant height: 22 – 25” tall. Adaptable to patio containers. 60 days.